After three and a half years in Portland, Jeffrey Jerusalem (Jeff Brodsky) has definitely made a name for himself as a one-man, disco-pop dance maker and show starter while garnering international exposure touring the world as part of YACHT’s fleshed out live band, The Straight Gaze. He dropped his debut LP, Grimace, in 2009, and the glitched-out, standout track “Disco Dry Mouth” is a staple at every JJ performance–hear it below. Following up the electro-diversity of that debut, he released an eclectic disc of remixes, This Is Why We Can’t Have Nice Things, for which he approached (mostly) Portland artists, including May Ling, Reporter, Wampire, Guidance Counselor, Nurses, and Atole, and re-worked their tracks. A drummer at heart, Jeff Brodsky has become the de facto man for the aforementioned YACHT and Bobby Birdman. But live, as Jeffrey Jerusalem, he’s still a solo performer and maker of “detail-oriented, arty, computer, disco-pop,” as Brodsky says. The last time OMN saw him live at Backspace, Jeffrey Jerusalem premiered some fresh tracks that navigated tropical waters, much in the same vein as the new Cut Copy album (due out on February 8th), with plenty of auxiliary percussion and humid electro-experimentalism–enough to transport you to somewhere warmer even if you weren’t sweating it up on the dance floor. OMN caught up with Jeff Brodsky to learn more about the little-publicized, highly dance-worthy man and what’s happening in his future, including a new 7-inch and his second full-length LP coming this spring… plus a music video recorded entirely on his iPhone. “People aren’t really good at describing their art,” says Into The Woods producer/director Jordan Kinley. This is the future of the music video. This is film making by Into The Woods–a team of webisodic video makers that focus on documenting Northwest music as it happens. 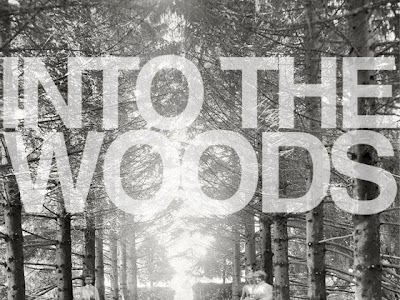 Into the Woods seeks to bring you live music, often with a behind-the-scenes vibe, from unexpected locations. Whether it’s inside Burgerville or from the actual living room (or kitchen or elsewhere, see below) of the musicians, the Into The Woods crew has captured more than 130 bands, musicians or artists on film and released more than 75 videos, all streaming for free on their website, in their first year of existence. Through documentary-inspired recording sessions that hope to “capture the personality and community of Portland [and Northwest] music,” Into The Woods is here to entertain (recording music videos and live performances from home and afar), inform (telling the narratives behind the band, like following artists to their day jobs, or teaching with tutorials led by musicians), and disseminate this content worldwide. They’ve even started to encourage you (local!) to get off your laptop and go see live music with their weekly Leave Your House PDX Show Guide. And the show they’d most like you to attend is at Holocene on Thursday, January 27th. It marks their first birthday. One year into the project, Into The Woods has succeeded at “seeing bands on a more personal level” but they’re looking to expand. Up until now, everything–all cameras, recording equipment, computers, lighting, microphones, hard drives, and money–has been scraped together by team members. Along with celebrating their first anniversary, Into The Woods is currently raising money to purchase the items necessary to establish “a fully functional set-up that will allow us to take the operation anywhere, anytime, without limitation”–including a couple of generators, a portable PA and monitors, lighting, and mobile audio equipment and a new mixer. A donation of $5 or more to their Kickstarter fund can get you advance entry to their Holocene party on January 27th, which features live performances by Tu Fawning, Skeletron (featuring members of Starfucker), And And And, Guantanamo Baywatch, and DJ Snakks (Zack from Breakfast Mountain), plus other donations will not go without rewards. You can score vinyl, CD packs, or “an afternoon playing Wall Ball with all 27 members of Typhoon.” Maybe those numbers are suited better for dodge ball? With just under two weeks remaining on their Kickstarter limit, they are more than halfway to their $4,500 goal. According to the Roth-Stavig wire service : "Evan no can read." Although in the cable TV world it may seem that Jersey Shore killed the video star, bands continue to make music videos by the thousands, and Portland is no exception. With our loads of local artists, from the screen to strings (and other instruments), we have an environment ripe for music video making. From shot-and-edited-in-a-day on whatever gear and budget the vocal and visual artists could cobble together to incredibly polished, professionally labored works, Oregon Music News has poured through the reels (and by reels we mean YouTube and Vimeo) and came up with a list of Portland Music Videos, which we will present at Mississippi Studios on Sunday, January 16th at 7 and 10pm. The first showing will include introductions and anecdotes from directors and artists while the second showing will feature several additional videos. We bring to the theater a swath of videos that represent Portland’s diverse scene. There’s the Portland Cello Project’s delicate plucking and bowing set to an entomological marionette (below) contrasted by good ole PDX rock’n'roll from The Dandy Warhols, Viva Voce, The Thermals (in a video that features Portlandia star Carie Brownstein), and Blitzen Trapper. We have amazing songwriters’ stories married with film from folk-inspired, indie-pop collectives like Y La Bamba, Loch Lomond, and Nick Jaina. There is live footage and documentary-inspired live takes from Into The Woods bouncing off electro-dance makers Glass Candy (with their first-ever video after 11 years together! ), YACHT, and Copy. And there’s even the Pink Martini contest winner from a filmmaking fan. 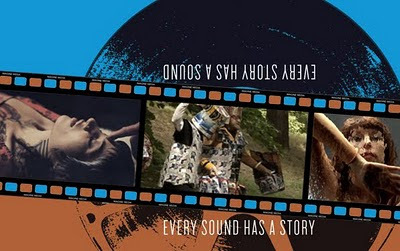 From professionally obsessed to hastily improvised, we’re proud to show you 90 minutes of Portland’s best crafted music paired with finely tuned visuals on the big screen. See the complete list of videos and directors on OMN and find all the music videos streaming here. Mashup: A mashup or blend is a song or composition created by blending two or more pre-recorded songs, usually by overlaying the vocal track of one song seamlessly over the instrumental track of another. To the extent that such works are “transformative” of original content, they may find protection from copyright claims under the “fair use” doctrine of copyright law. No one delves into the depths of “popular” music like the Chicago-based mashup makers The Hood Internet who take the layers of indie rock and pop and ever so deftly mix them with R&B and hip-hop. One listen to 2009's “Two Weeks Of Hip Hop” sees a graceful mashing of the harmonious, swirling indie-pop piano of Grizzly Bear with the raw, militant vocals of Dead Prez. Two songs so diametrically opposed all of a sudden seem made for one another–like one is incapable of existing without the other. That’s the beauty of The Hood Internet. The Hood Internet is composed of STV SLV and ABX (pronounced like three consecutive letters aka Aaron Brink) who have now released some 400 free mashups that have been downloaded millions of times via their blog. 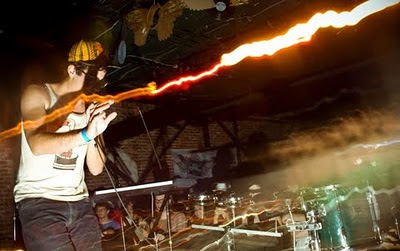 Kindling dance parties in cities across the US, they’ve been featured at Lollapalooza, Bonnaroo, Monolith Festival, SXSW, CMJ and Canadian Music Week. No stranger to Portland, they’re back on Wednesday, January 12th at Rotture. 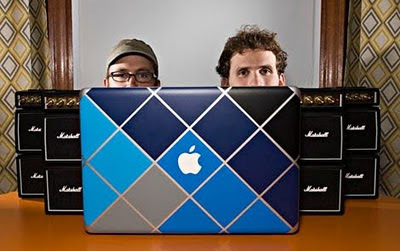 But are mashups the only thing these laptop chemists have in store for us? For now, you’ll just have to enjoy the honest-to-goodness quality of their mashes while an album of original material is forthcoming in spring of 2011 at the earliest. OMN exchanged a string of emails with on half of The Hood Internet’s STV SLV, who you can catch crouched behind his MacBook on Wednesday night at Rotture. Do your mashups include any original compositions? Or is everything borrowed? STV SLV: Occasionally we’ll add some drum sounds or extra bass, but for the most part, it’s all borrowed. How much time goes into a mashup? How many do you put out a week? Depends on what we’re working with. Sometimes they come together really quickly, others take a large amount of fine-tuning. We try to put out a couple on the website every week, but that varies depending on what else we have going on. At this point we’ve made over 400 since the site started. For a band that had to be coaxed into releasing their first vinyl, Little Dragon is doing quite well for themselves. The Swedish quartet from Gothenburg spent the end of 2010 touring the world with Gorillaz after being featured on two tracks (“Empire Ants” and “To Binge”) from the animated band’s third album, Plastic Beach, which wound up on many best of 2010 lists. Skipping across continents, Little Dragon supported Damon Albarn’s Gorillaz and De La Soul in Europe, Australia, New Zealand and Hong Kong on the Gorillaz: Escape to Plastic Beach Tour. With no initial hopes or aspirations, Little Dragon continues to keep their cool and simply remain in love with the idea of “creating new sounds and making new songs” as bassist Fredrik Wallin puts it. Childhood friends since their teens and later living together in a cooperative called the The Seal Colonie in Gothenburg, the initial story of vocalist and percussionist Yukimi Nagano, drummer Erik Bodin, Fredrik Wallin, and keyboardist Håkan Wirenstrand can be found in their official bio by Ulla Tom Tom. Their first single became the Rough Trade single of the week and the band was picked up in the UK by Peacefrog Records, which released their 2007 self-titled debut. And even though that first album is still available as an import only, fans immediately clung to the cool, down tempo jazziness of that album, garnering supporters across the globe from DJ Shadow to KCRW in Los Angeles. 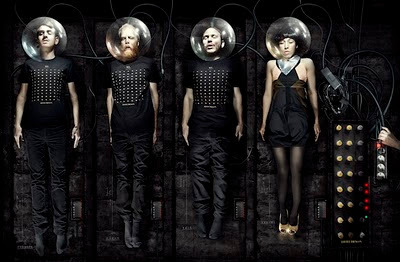 Another album (Machine Dreams) came in 2009 and now Little Dragon visits Portland for their third time at the Doug Fir on Monday, January 10th with support from multimedia soundtrackers Billygoat (made up of Portland stop-motion artists and musicians David Klein and Nick Woolley). The hometown duo will not only open the Doug Fir date but also travel 25 dates (their first exposure to the greater world) with Little Dragon from west to east and back again finishing up with two dates in San Fran in early February. Joining Woolley and Klein on the tour will not only be their trusty projector and arrangements on harp, keyboards, accordion, glockenspiel and electric guitar but also their newest addition: Corey Nelson on live drums. Read the rest on OMN and win tickets to see Little Dragon with Billygoat at the Doug Fir.